The perfect starter desk for your toddler, and an excellent space for creative endeavors, the PlanToys table and chair set has a sleek bent wood design and multifunctional aspects for an active tot. 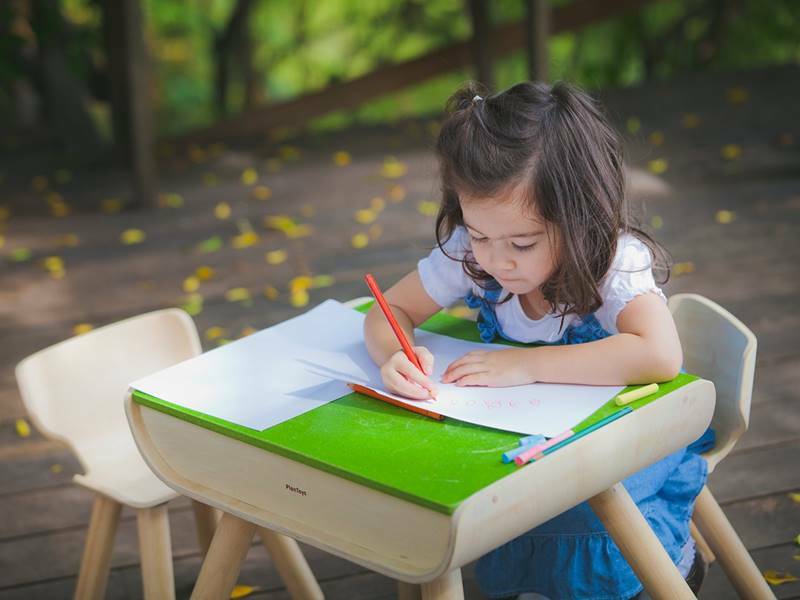 The table features two handy compartments for storing paper and other eco-friendly art supplies, sturdy support and a desk top that toddlers can draw on using chalk as well. The chair also has a bent wood design that contours nicely to little bodies. The whole set is made of sustainable rubberwood and non-toxic dyes. This is a great little table and chair set at an affordable price for children 3-6 years old. The perfect starter desk for your toddler, and an excellent space for creative endeavors, the PlanToys table and chair set has a sleek bent wood design and�multifunctional�aspects for an�active tot. The table features two handy�compartments for storing paper and other eco-friendly art supplies, sturdy support and a desk top that toddlers can draw on using�chalk as well. The chair also has a bent wood design that contours nicely to little bodies.�The whole set is made of sustainable rubberwood and non-toxic dyes. This is a great little table and chair set at an affordable price for�children 3-6 years old.